The VERVET MONKEY, Chlorocebus Pygerythrus is widespread across the eastern part of South Africa. It has been introduced to a number of states in the USA as well as the West Indies. Vervet Monkeys are highly interactive and great fun to watch because of the complex social relationships within the troop. Their behaviour is nothing short of outrageously entertaining especially when there are youngsters around. As a result of the shortage of food in the bush, our monkey troops at Tremisana and Marc’s Treehouse Lodge have become bolder. It has become necessary to have a designated staff member constantly patrolling with catapult in hand. At Tremisana we have tried to get around the thieving from the breakfast table by putting out the kitchen scraps a few minutes before we serve breakfast. 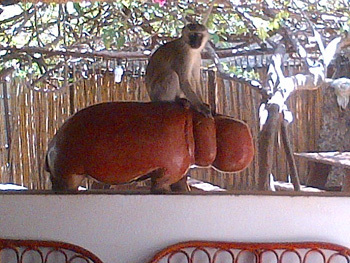 The monkeys then congregate around the scraps and our guests can enjoy breakfast in peace. I think we have prayed too hard for rain ! It hailed ! There were hailstones the size of golf balls at Tremisana. I understand that these were tiny compared to tennis-ball size stones that fell in Hoedspruit. The bad news is that a number of Mango plantations were destroyed. The immature fruits that were knocked from the trees were used to make Atchar but we shall struggle without our Mango and Ice Cream desserts at Marula Boma. Delina has already engaged the transfer guides to buy mangoes along the road and she assures me that my favourite dessert will still be served – thanks Delina ! It was a beautiful afternoon and I had some really happy guests from USA and Germany. Our first sighting was a herd of elephants feeding along the Olifants River. After that we went to the cement dam and found two impalas and lots of mongoose busy drinking water and grooming. One of my guests spotted a leopard hiding behind the grass and looking at the impalas. It eventually moved off. Further along the way we met a guide from Ezulwini and he informed us about a lion sighting on Xingalana road. I drove straight to the area and while I was driving off road, we got stuck twenty metres from the lions. The lions started walking towards our Cruiser and came right next to it. The guide from Ezulwini helped keep the lions away and tried to pull us out. It took almost an hour to get out. One of my guest was unhappy and she started screaming. The other people were happy and enjoyed the sighting. I told everyone to calm down and we got out fine. I was getting ready for morning drive when the monkeys started going crazy by making noise to inform other monkeys about the danger within the area. I went to area to look around and we found a leopard walking along the fence walking towards the dam to drink. It walked to the dam and drank water. Thanks to the monkeys that we saw the leopard ! Leopard sighting thanks to screaming monkeys. It was very cold and raining but great weather for game viewing and we got the Big Five in the first two hours in the park. Our first sighting was four male lions eating an impala and a baby buffalo along the Orpen road. On the S6 at Rockvale pan we found five lionesses eating a zebra that they had just killed. It was still kicking and the other zebras were making lots of noise and moving around the dam. We found elephants everywhere and two black rhinos north of Satara. The day has just begun – we were feeling especially lucky today. 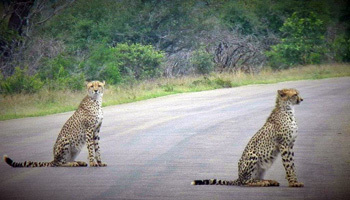 On the drive to Kruger, we had already seen two cheetah. It was through the fence of a neighbouring reserve, but they all count. The weather is perfect, the sun is hidden by a few clouds, giving us shelter from the heat. The first animal to grace us with its presence happens to be a big old buffalo. Slowly walking along the side of the road, feeding on the fresh new shoots of grass, he looks a little grumpy. Not far from Orpen gate, we notice a string of vehicles parked along the road ahead. It’s African Wild Dogs, a rare and spectacle sighting, almost forty of them lying about next to the road. The wild dogs simply lay down in the shade, relaxing while the sun grows stronger. We took a long look at the wild dogs and then decided to continue, who knows what could be next. It happened to be a small bachelor herd of elephants, all big bulls quietly going about their business. We continued travelling towards Satara rest camp, finding large amounts of plains game along the way. The excitement was just about to get real, we had stopped to view a herd of elephants. No one expected to see a leopard so close to these large beasts, but suddenly this changed. A leopard appeared from nowhere, popping out from behind a tree. He moved up the side of the river bed and lay down in the shade of a small bush. It was when the elephant noticed his presence that things got interesting. The elephant looked towards the leopard and continued to throw dust on its back. All of a sudden the elephant put its head low, and ran straight towards the leopard. An incredible scene to witness, the leopard then slunk off into the bush, out of sight. Interesting interaction between Leopard and Elephant. It was now time to head for lunch, along the way we spotted a few hippopotamus as well as a journey of giraffe, who all posed beautifully for the camera. I received some information at lunch from my fellow guides, and excitedly told my guests our plan. 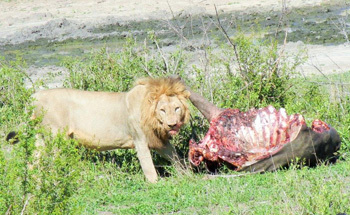 We were heading north towards a lion sighting – the lions had taken down a buffalo. This meant they should still be in the area. The first thing we noticed was the buffalo, the lions had ripped it open, and the ribs could be seen. At first we could only see one big male lion, sitting beside the kill. The second male then stood up and walked across to the buffalo, and began ripping away at the remaining flesh. These two lions would have worked together to take the buffalo down – lions are very strategic hunters. The last on the list happened to be the rhino, so off we went. The rhinos spend a lot of the day sleeping, and can often be spotted moving around in the late afternoon. We had started to head back towards Orpen gate – still no rhino. We had seen several herds of elephants, which was fantastic, especially the little babies running alongside their mothers. Then out in an open plain we spotted a creature that couldn’t be anything other than a rhino. It was walking along slowly, giving us a beautiful side on view. It just moved off along its path, we had been lucky, very lucky. Our Bush Walks have been productive this month : We have regularly seen Black Rhino, Elephant, Hippo and Crocodile. The pride of 10 lions has also been around – they have moved all over our concession in search of food. The six cubs are getting big now and are very accustomed to our vehicles. Pride of lions on road near Tremisana. We have also had some good leopard sightings especially on our Sunset Drives. We have started with our new Sundowner drives this month. We leave Tremisana at 15h30 and drive until a few minutes before the sun sets. We then find a good spot to view the sunset and we set up a table with snacks and enjoy the sundowner drinks. All my clients have really had a good time. The drive continues after our drinks break and we return to Tremisana at around 19h30. November has been absolutely amazing in terms of game viewing. Despite temperatures reaching up to 40 C, Kruger National Park has certainly lived up to its standards and delivered some fantastic sightings. On S39 a male leopard killed a baby zebra and took it up a Marula tree‎. It was a fresh kill because we could see the intestine hanging from the side of the branch. The Timbavati river road was a little quieter this month and we concentrated on the S100 and S125 near Kumana Dam. On S100 we found mating pair of lions right. They were very active and every five minutes they mated. At Nwanetsi bridge we had regular sightings of a lioness nursing cubs about a month old. We had an extraordinary day starting with three rhinos next to the road, followed by a male leopard lying next to the road. Next were Wild Dogs : we got about twenty of them on Sweni road. The pack were resting easily next to the road. Kumana Dam had two large male lions that killed a full-grown buffalo bull in the morning. As we arrived in the afternoon it was quite hot and we were fortunate to witness them dragging the carcass to the shade and away from the vultures. It was very impressive to see the pure strength of these males as a buffalo can weigh up to 850kg. On the 2nd of November, as we came up to the S36 there was a large male lion just resting in the shade. At the S40 we came across 3 cheetahs. On our way out of the park we were fortunate to see a hyena next to the road. As we drove out of this sighting we bumped into 5 White Rhinos also lying down. The next day we found a mating pair of lions very close to the road. A few kms further on, we came across 2 male lions with a buffalo kill. On the 5th we had a great sighting of two Male lions after the S90 junction. The highlight for the day was just around the corner. At Vulture Pan, we spotted 2 black rhinos. I know that they see Black Rhino at Tremisana but it is quite rare to see black rhino in the park. On the 7th, we headed straight to Ngotso Dam to view two lions that had just made a fresh buffalo kill. On the way to lunch we saw 2 white rhinos heading towards us and eventually walked out past our vehicle. Towards the end of the day, a big male leopard came out of the bushes and walked along the side of the road just next to us. On the 8th we also had another good day with 5 out of 5. 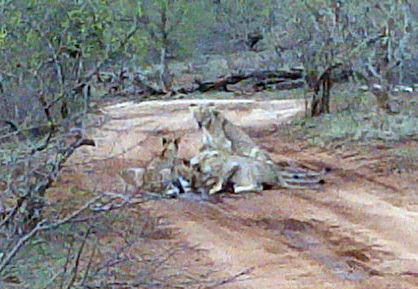 Along the Sweni road we found 6 lions. Further on we bumped into 2 White Rhinos, relaxing in the shade. At lunch we received an update of a Leopard sighting. We headed to Nsemani Dam and saw a leopard in a Jackalberry tree with an Impala carcass. On the 10th we also had another day where we got 5/5. Along the Timbavati riverbed we found 3 lions After Lunch we headed to Kumana Dam where we found a Leopard in a Sausage Tree. On the way out we found 2 Cheetahs and another pride of Lions. Near Phelwana we enjoyed a brilliant sighting of White Rhino . The 21st was another Big 5 day. Near Orpen we had an impressive sighting of 2 Male lions eating a zebra they had just taken down. Along the Timbavati we had a great sighting of a Leopard lying down under a tree just next to the road. On the S100 we saw some lionesses with playful cubs. Further on were some White Rhinos grazing in the distance, and of course the S100 is a hotspot for elephants. We found a large breeding herd with lots of cute small babies. On the 22nd we saw 3 lionesses with many cubs down at Nwanetsi bridge. We were fortunate to get a very rare sighting of cheetah crossing the road in front of our vehicle. We also saw 800+ buffalos. Late evening sighting of 2 Cheetah on the road near Orpen. With the threat of a massive drought, November has been quite difficult. I have been blessed with some amazing sightings especially now that it is the new baby season : monkeys, jackals, elephants, lions and many more. Interesting is that the impalas have not yet lambed! My first great sighting started with a lioness and her newborn cubs near Satara. They were in the same spot for about 10 days. Another great and rare sighting was of a Black Rhino. Another great sighting was of lions lying in the river bed. They crossed right in front of our open vehicle one by one. We then realised they were hunting. I saw a giraffe nearby. It was awesome to see the lions start strategically planning their way – all the lions split up to assume their positions to ambush. The giraffe saw them and ran away as fast as her long legs could carry her. 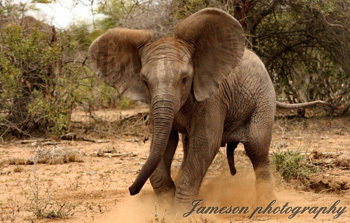 We have been blessed with some amazing elephant sightings. One that stuck out was a baby Ellie with its family that decided we were not welcome and that he was going to try and chase us away. Of course he was a baby so we just laughed at his dancing and running around trumpeting like a child would when throwing a tantrum. It was hilarious. Baby elephant throwing a tantrum. 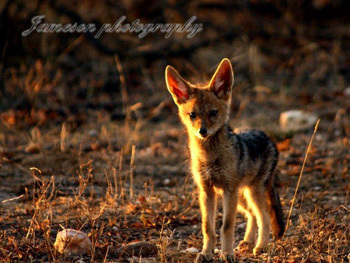 On one of the morning bushwalks we were lucky enough to get a few cute little jackal puppies. One was particularly curious and started coming close to our Landcruiser and looking sooooo cute as he tried to figure out what we were. On one of our amazing drives through Kruger we managed to see Wild Dogs sleeping with bellies full right next to the road. What a treat as they are really rare and highly endangered. We finally got what we asked for…rain!!! But with the beautiful rain we also received huge hail that made sure that the bush will get enough water. Unfortunately the hail defoliated the trees ! Omw.. This month I was very blessed to see my very first Aardvark!!!!! I almost screamed and was dancing in my car. This is a very rare animal to find especially in Balule so when I saw it I thought was dreaming! It was an amazing experience. We also got to see our lion pride of 6 cubs, 3lionesses and 1 lion and was very relieved that they all made it through the big hailstorm. Recently I got some hyena at the Marula Boma. One was a few metres away from my Landcruiser just looking at the vehicle and listening around him. Was very nice to be able to sit and watch these amazing animals we even got a nice whooping call from it while standing there…which gave us all goose bumps. Sunset after the devastating hailstorm. What a month November has been for us out here at Marc’s Treehouse Lodge. From sightings to weather conditions, bush transformation and the arrival of the babies of Summer! Our guests have been very happy this month in terms of their experiences staying at the lodge this time of year, they have enjoyed some impressive electrical storms and have had the privilege of some of the most outstanding sightings in Kruger National Park. Around the camp it is baby central! 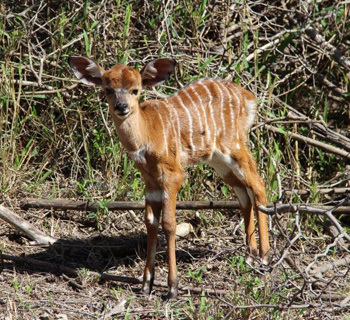 The Nyalas have given birth to their young and are not shy to introduce them to the staff and guests around the lodge. On two occasions some guests have been lucky enough to witness the mothers delivering their babies next to their rooms. On both occasions the exact same comment was made on how incredible it is that the babies are on their feet walking around almost instantly. It is quite a privilege for our guests to witness this, as the Nyala population here is such a unique part of our camp. We find the mothers often leave their newborns around the lodge, while they go off and feed. They will leave them because they know the babies are safe from predators and we certainly would not hurt them. I am fortunate to have a young one that stays under a bush next to my room, the little thing is so adorable and I find I’m getting more attached every day. We have had crazy weather this month. We have gone from days where temperatures reach to over 40 degrees, then the next thing we are hit by a destructive hail storm. The hot days are more frequent, which draws us all to the swimming pool, but as we live in a tropical area with hot days comes rain! Yes that long awaited rain we have been waiting for has finally touched down! Not as much as we hope for but still, some is better than nothing. One particular downpour turned quite hectic! We were faced with some large sized hail with heavy, heavy rain. Our camp was fortunate enough to have no serious damage. With spurts of more rain, you can really see the grass starting to shoot through and the trees starting to flower. We have also been lucky enough to get some absolutely phenomenal electrical storms. If the power is not already out from the storm, we sometimes switch the lights off to really enjoy the beauty of watching the lightning and listening to the thunder as the sky is completely lit up. Some guests who are into their photography have captured some impressive lightning shots. Of course with the rain come the little amphibians, insects and reptiles some guests are not so fond of. We say if the rooms don’t have a little frog or gecko present then your actually missing out on one of the best insect repellents out there. The dung beetles are starting to emerge and rolling their balls around the reserve which is always an interesting hit for the guests. One animal happy for the scorching sun are our resident skinks and lizards, we often find them sun baking happily on a rock to warm up their body temperatures, not a bad life these guys have hey! For now the mosquitos are remaining quiet but we still get that irritating buzz from time to time so we are making sure everyone are using their nets and bug sprays. The Kruger trips have been seriously amazing this month. The guests are coming back with stories of their tour and are so happy with what they have seen in just one day! 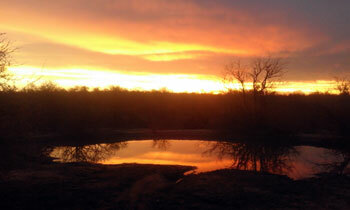 Kruger is really living up to its name this month. The cat activity has been overwhelming, with many leopard and cheetah sightings which is certainly not a common occurrence. 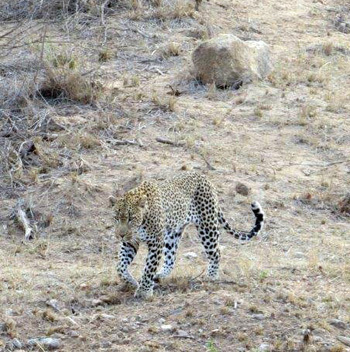 One particular day a group came back with 3 separate Leopards in one day! WOW! The cheetahs have also been very active. Patrick has seen cheetahs quite often this month very close to his vehicle and even crossing in front of him. The lion sightings have been on fire also this month, we have had the guides get the vehicles very close to mating pairs on more than 6 occasions; they have found mothers with cubs and numerous kills they have seen lions feeding on. It has truly been exquisite this month. Big 5 days have occurred frequently plus cheetah as well as the critically endangered Wild Dogs. The most special sightings have been the black rhinos! It’s very rare to find the black rhinos in the park so yet another plus for the Kruger trips. The guides have said Kruger has more than exceeded their expectations this month and has made the tours really enjoyable. This month on the 15th of November 2015 something really dramatic yet amazing happened here in the Balule Game Reserve. The day started as usual : hot and dry, our dams, apart from Tremisana Dam, are all empty but with summer here the trees had all started blooming and going green but yet because of the drought the animal sightings weren’t the greatest. We didn’t expect any rain for a while but a big storm started brewing far south which looked very promising. When late in the afternoon the wind picked up and the coolness of the fore storm was pleasant as we waited anxiously. Suddenly something really unexpected happened. A HUGE hail storm hit and it started pouring with heavy rain and large hail stones the size of golf balls started and the guests had already left for game drive and were stuck out there in the hail. We couldn’t see much, just a white blanket in front of us as we all watched the hail cause so much damage. Eventually after about half an hour the hail subsided and we were able to see the immense damage that had been caused. Windows, trees, roofs and a lot more was destroyed. Heaps of hail up to our knees were all over and all the leaves that had started growing were all lying on the floor throughout the lodge making it look like winter again and as if elephants had come rampaging through the lodge. Later after surveying the damage we all realised that all the water we were praying and hoping for was finally delivered and all our dams were filled to the brim and we realised that soon it would look beautiful again. Everyone was excited and happy and our Shangaan staff started singing. It has been a tough year for a number of reasons: the Ebola scare; the Xenophobia outrage; the nonsensical issues relating to Visas and unabridged birth certificates and the general slowdown in universal economies. We also took a massive body blow with the untimely road accident death of our beloved Ronald Masango, manager at Marc’s Treehouse Lodge. It looks like the tide has turned with regard to tourist numbers. We have had a busy November and December will be a bumper month ! Our new 4 star Katekani Lodge is looking good and we are likely to open on 1 January 2016. I wish to thank all our staff for the hard work that they put in, year after year, in making Viva Safaris the successful operation it is. When I was searching for a name for the new lodge, Margrett, supervisor at Marc’s, gave me a number of Shangaan names. I chose Katekani because it means “Blessings “ and we certainly have been very blessed in the 25 years Viva has been in operation. Not least of these blessings has been the enormous contribution made by our mainly Shangaan staff. Viva Safaris has attempted to return some benefits to the local community. Trevor and Bongani are involved with a community clinic and Sandra works extensively through the Comboni Missionaries at the Acornhoek Catholic parish. 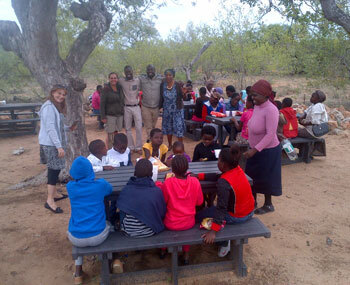 On the 28th of November, we invited 30 orphans from the Acornhoek parish to Olifants West Game Reserve. They were taken on a morning game drive, then given a barbeque lunch at our Marula Boma and then given goodie boxes that included toiletries, food items and stationery. Group from Acornhoek Catholic parish. Thanks to Ian manager of Pick n Pay Phalaborwa for his customary charitable contributions. My husband and I were looking for a quaint, more personal experience for our safari vacation. Tremisana Game Lodge was that. We stayed there for one night before heading to our next location. 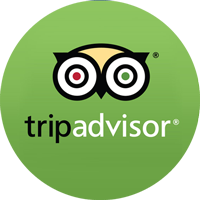 The staff was very friendly and maintain the time schedule very well to make sure everyone makes it to all game drives and meals without concerns. The room were small and clean, you are only in them to sleep. All of our game drives in the Balule reserve were amazing! It was quite the experience to see these animals up close and in their natural habitat. All of our guides were knowledgeable, nice and worked very hard to search for animals for us. Our bush walk was very enjoyable. Our guide, Rex, had a good sense of humor, and provided a lot of information about the animals behaviors. We would definitely stay here again! We spent a few days at Marc’s and loved our experience. We ended up in a treehouse right by the reception area and it was for a family of 4 so we had a lot of room. There was a bathroom built into the treehouse so we didn’t need to leave in the middle of the night. It was a rustic sleeping experience and everything we were looking for. Meals were in a covered eating area which was nice to be able to chat with the other guests and share game drive stories. I am a super picky eater and one night asked for sandwiches at dinner as I did not really want what was served (Only because I’m picky, not because the food was bad). They made me two sandwiches and delivered them with dinner. They were so accommodating to my eating habits.There were antelope that walked around the area and let you get within a few feet of them and the monkeys were very playful. Our game drives were fun. The day we went into Kruger National Park it poured and was freezing. Our guide was upbeat and informative and did a great job finding animals for us during the day. With the overcast rainy weather our pictures were amazing!! Our guide, Patrick, stopped at gift shop before we entered the park so we could buy sweaters or hats or coffee’s. The staff, from lodge to game drives, were very friendly, fun to talk to, informative and provided a great experience for us!!! 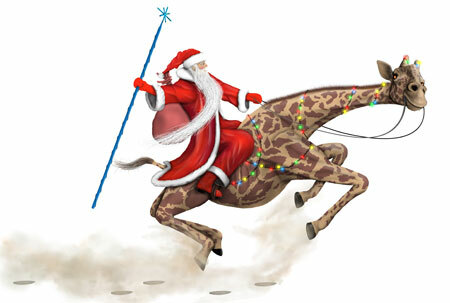 On behalf of all at Viva Safaris, I wish you a Blessed Christmas and everything good in 2016.